Happy Launch Day to THE PROMISE OF FORGIVENESS & Marin Thomas! Hi everyone! Today we’re thrilled to congratulate Marin Thomas as her women’s fiction novel THE PROMISE OF FORGIVENESS hits bookstores everywhere. THE PROMISE OF FORGIVENESS is a novel of love, forgiveness and the unbreakable bonds of family. Ruby Baxter is a resilient single mother, struggling to keep her daughter on the right path when Ruby’s biological father calls her home to accept her inheritance—a dusty oil ranch in the Oklahoma panhandle. Ruby and her father, Hank, struggle to connect, while her daughter, Mia, forms a strong bond with her grandfather and the nameless animals on his ranch. While the three slowly come to an understanding and embrace forgiveness, the ranch hand, Joe Dawson, tempts Ruby to trust one last time and the four become an unlikely family. To celebrate, Marin stopped by to talk writing, the amazing story of how she first got published, and her most memorable reader interaction (which brought us to tears). The road to publication is twisty. Tell us about some of your twists. My first published book with Harlequin, The Cowboy and the Bride, came about in an interesting way. An editor picked my manuscript out of the slush pile and offered me a chance to revise and resubmit. I jumped at the opportunity, but when I resubmitted the tweaked manuscript, it landed on the desk of a different editor and my personal note thanking the requesting editor was missing. The second editor passed on my revised manuscript, stating the story wasn’t the right fit for the line she edited. Gathering my courage I phoned the second editor, wanting to explain that my manuscript had not been intended for her but another editor. Before the conversation went any further, the editor on the phone abruptly cut me off, because they were evacuating the building. I hung up and turned on the news and learned a plane had hit the first Twin Tower in New York City. It was September 11, 2001. I began an agent search and once I signed with my agent, she straightened everything out with the editors and I sold my manuscript to Harlequin. Have you ever tried writing in a different genre? How did that work out? I’ve been writing series romance for Harlequin since 2004. A few years ago I informed my agent that I wanted to write a bigger book. Since the romance stories I was already writing revolved around community and family drama and took place in small towns my agent suggested I give women’s fiction a try. So the bridge between the two genres was a short one for me. What I love most about women’s fiction is having a higher word count to delve deeper into my character’s journey and I still have room for a romance if the plot calls for one. I’m currently working on my second women’s fiction novel for Berkley/NAL, which is scheduled for publication March 2017. This novel takes place in a small town in west Texas. Tell us about your book’s title? The working title for THE PROMISE OF FORGIVENESS was Unforgiven, the name of the town in my novel. I learned early on in my career not to invest too much time or heart into a working title, because my ideas never match up with marketing or editorial. When I begin a new book I use the location of the story or the town name as the working title. My editor gets the credit for naming the book THE PROMISE OF FORGIVENESS. Tell us about a memorable reader interaction? When I first became published with Harlequin I received an email from an elderly gentlemen in Canada, saying how much he enjoyed my Harlequin romances. I remember thinking someone in my family had pranked me—men don’t read romances, right? Well, Henry set me straight. We became pen pals and Henry read every one of my books until he passed away a few years ago. I always looked forward to hearing what he thought of my latest story as well as what his grandchildren were up to. I miss him. What’s the best perk about your job? I’ve always loved the flexibility of working from home. When my children were young, I was able to attend most of their school activities, chaperone trips and coach youth basketball, while still working on my books. I thought when my husband and I became empty nesters, day-to-day life would settle down and I’d be gifted with long periods of quiet uninterrupted writing time. Instead, my office has become the Four Paws Senior Daycare, which is another perk about my job—I can write and still be here for our elderly pets. Thanks for stopping by, Marin, and all the best to you and THE PROMISE OF FORGIVENESS! Want to know more about Marin’s books and where to buy them? Visit her website! Marin Thomas is a directionally-challenged small-town girl at heart who has penned over twenty-five western romances for Harlequin Books, including the bestselling series, The Cash Brothers. 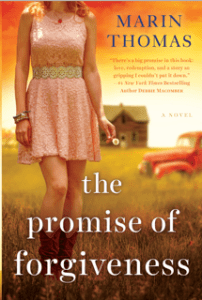 THE PROMISE OF FORGIVENESS (Berkley/NAL) is her first women’s fiction novel. When Marin isn’t writing she’s researching ghost tours or stalking estate sales and vintage junk shops, searching for her next story idea. 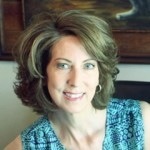 She and her husband are recent empty nesters living in Houston, Texas. You can find out more about Marin and her books at www.marinthomas.com, and connect with her on Twitter, Facebook, Instagram and Goodreads. Love all your books and can’t wait to start this one. I love that you became a pen pal with your reader! Great writers are sometimes great people, too! Can’t wait to read. 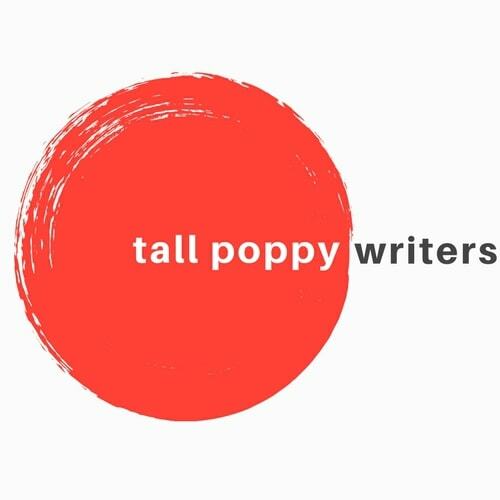 Hello, Marin (and Tall Poppies)! Marin, you know how thrilled I am for you about your new women’s fiction novel, and I just wanted to pop in and say “Happy Release Day!” on the actual date. I can’t wait to read this. Congrats on your release! Thank you everyone for the kind words and congrats on the release of The Promise of Forgiveness! If you get the chance to read the book I sincerely hope you enjoy Ruby’s story!